BOARDMAN-Boardman's Riverside Pirates, last year's second place 3A OSAA state finalist hosted one of the most powerful soccer teams year in, year out in the Greater Oregon 4A Mac-Hi Pioneers from Milton-Freewater on Thursday. Mac-Hi jumped out to 1-0 lead with a goal in the first minute of play on a drive through the left side of the box. Riverside was looking like it was going for a goal when they drove into the right side of Mac-Hi's box at the 17 minute mark but the goal was waved off because the Pirates were off side. Mac-Hi scored their second goal around the 24th minute when number 22 worked his way across to the left side of the box and kicked it back across catching the Riverside goalie leaning the opposite way. Mac-Hi's third goal came on a penalty kick at about the 30th minute. The first half ended with Milton-Freewater's Mac-Hi Pioneers leading Riverside 3-0. 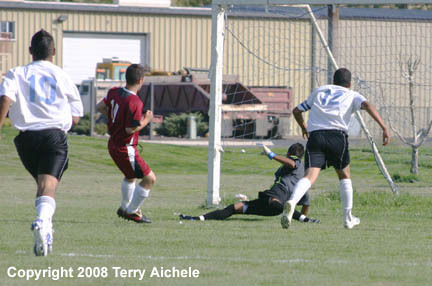 Mac-Hi scored in the 3rd minute of the second half with a kick deep into the corner of the netting to take a 4-0 lead. The Riverside Pirates finally shot a clean goal in about the 11th minute of the second half when number 16 drove straight up the middle of the field blasting it past the Pioneer goalie. The Riverside fans must have been hoping that their team was about catch fire. 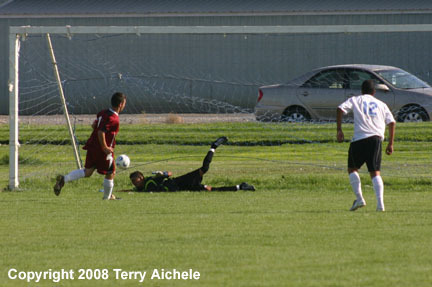 However, just two minutes later Mac-Hi nailed another kick deep into the corner of the Pirates net to take a 5-1 lead. 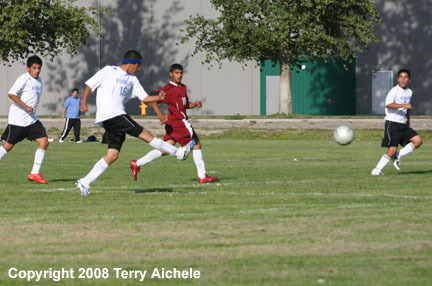 Ten minutes later, in about the 24th minute of the second half, Mac-Hi hit another goal and took a 6-1 lead. In about the 29th minute Mac-Hi's number 10 drove a goal in from the right side of the box to give the Pioneers a 7-1 lead. In the 35th minute number 3 for Mac-Hi driving through the box from the left side chipped a shot over a Pirate defender for the final goal of the match. The Pioneers won 8-1. LEFT - Mac-Hi forward number 10 drives towards the left side of goal for a shot. 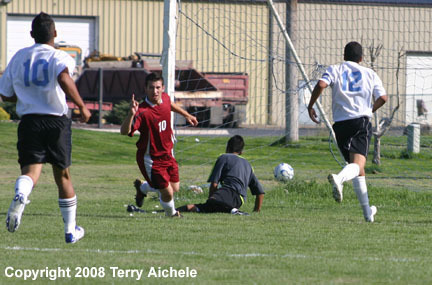 RIGHT - The Mac-Hi Pioneer forward celebrates his goal in the first minute of play. 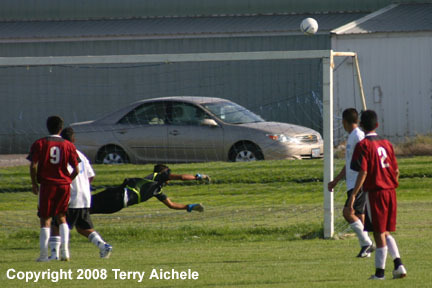 LEFT - Riverside's goalie stretches to reach a penalty kick by Mac-Hi forward number 10. The penalty kick gave the Pioneers a 3-0 lead early in the first half. RIGHT - The Pirate goalie gives everything he has but comes up short on deflecting or blocking the penalty kick. 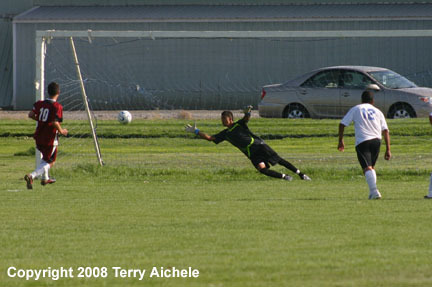 LEFT - The Riverside goalie makes a nice play blocking a hard driven kick coming from his right. 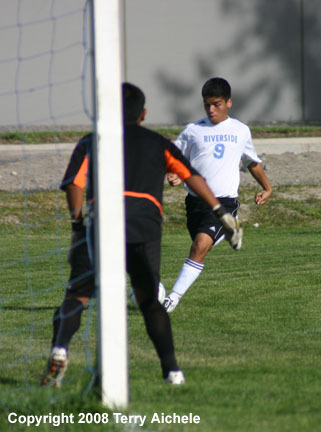 RIGHT - A Riverside forward drives towards the Mac-Hi goalie in the first half. 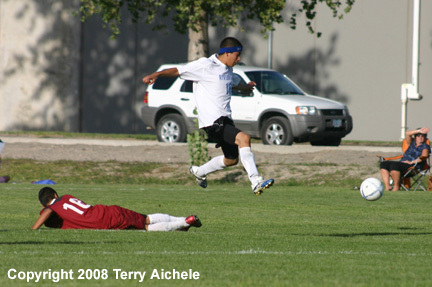 LEFT - Riverside's number 16 lets fly with a kick that scores their only goal at about the 11th minute of the second half. RIGHT - Later in the second half the Pirate forward makes his way through a Mac-Hi defender but misses his shot.